A proper old traveller’s inn, the privately-owned Kings Arms dates from the seventeenth century. Given its location it is unsurprising that it has accommodated a few famous historical names in its time. These include Bonnie Prince Charlie in 1745, and Sir Walter Scott in 1813. Even Robbie Burns is said to have been a guest. 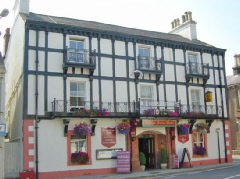 Family-run, the Kings Arms offers 13 guest rooms, a cocktail bar, lounge bar and restaurant. It is also dog-friendly. More details for the Kings Arms Lockerbie to be uploaded soon.